for May 3rd are Glorious. The first 12 issues of this newsletter are now available in book form under the title, Shepherds of Christ Newsletters: Selected Writings in Spirituality for All People—as Published in the Shepherds of Christ Newsletters for Priests. A number of the newsletters are now available on audio cassettes. Shepherds of Christ Center, Box 193, Morrow, Ohio 45152, U.S.A.
WE ARE EXPANDING OUR READERSHIP! We are expanding our circulation by explicitly inviting to our readership those who are not priests, but who are interested in the spiritual life. 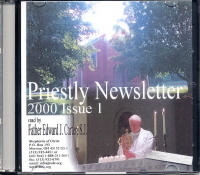 The Newsletter will still be written for priests in a specialy way. Yet we feel much of the material will also be of interest to those who are not priests. To reflect the fact that we are now expanding our readership to include all interested parties, we think it is appropriate to offer a new act of consecration which is not worded for priests only, but one suitable for all. He hung upon a cross on a hill called Calvary. Death was near. How much Jesus had already suffered! He had been derisively crowned with thorns. In a terribly weakened condition, He carried the heavy cross to the hill of Golgotha. There He was stripped of His garments and mercilessly nailed to the cross. After all this brutal and agonizing suffering, Jesus finally died. Truly the Good Shepherd had laid down His life for His sheep. That magnificent Heart, overflowing with love for His Father and all of us, had beat its last. Yes, the Good Shepherd died and rose for our salvation. Behold, the paschal mystery of Jesus! Christ has structured the Christian life by the way He lived, died, and rose from the dead. It is obvious, then, as Paul tells us above that the pattern of death-resurrection must be at the heart of the Church’s life. Individually and collectively, we continually die in Christ so that we may continually rise in Him. Thus we pass over in a process of ongoing religious transition to a greater participation in Christ’s resurrection. It is true that our participation in Christ’s resurrection will reach its completion only in eternal life. Nevertheless, we begin the life of resurrection here upon earth, in the here and now of human life, in the midst of joy and pain, in the experience of success and failure, in the sweat of our brow, in the enjoyment of God’s gifts. As Christians, we should have a sense of dynamic growth concerning our here and now life of resurrection. We cannot maintain the life of resurrection or grow in it without a willingness to suffer. This does not mean that we need to feel overwhelmed and heavily burdened in our lives. The greater portion of suffering for most Christians seems to be an accumulation of ordinary hardships, difficulties, and pains. At times, however, deep suffering, even suffering of agonizing proportions can enter into one’s life. Whether the sufferings one encounters are of the more ordinary variety or of the more rare and extreme type, Christians must convince themselves that to relate properly to the cross is to grow in resurrection, and growth in resurrection means we will also have an increased capacity to help give resurrection to others. Dom Hubert Van Zeller observes: "Men and women who might be turning their afflictions over to God, who have only to unite themselves in spirit with Christ’s passion, are found so often to stop short, and even to make of their trial further matter for selfishness. Even if we do not rebel positively against God’s providential will, we can become so preoccupied with our troubles as to leave God out of account. "Instead of making us compassionate for others we can squander compassion on ourselves. Suffering is meant to enlarge our hearts, not shrink them. With suffering goes the grace of patience, peace, fortitude, penitence and love. All this can be missed if we make the mistake of turning in upon ourselves as the result of our trials. Contrary to what many think, Fr. Edward Leen reminds us that suffering is compatible with happiness: "If men are prone to err in conceiving the nature of happiness, they will necessarily err in judging of its opposite. They commonly think that a man cannot possibly be happy if he is a prey to constant sickness; if he is condemned to experience habitual poverty and to be buried in obscurity; if he fails to take an important part on the world stage; if he is unsuccessful in his enterprises; if he is deprived of the opportunities of intellectual or aesthetic development; and finally, if he fails to gain the applause and the esteem of his fellows. Now though all these things mean grievous sufferings for men, neither singly nor in combination have they the power to rob him of essential happiness. Caryll Houselander writes with great sensitivity regarding the second station of the Way of the Cross: "They put His own garments on Him again, and Jesus comes out from the judgment hall of Pilate to receive His cross. "So that we may be able to follow Christ we must never cease to dwell on His life and teaching; otherwise our prayer to God will inevitably assume the character of a vague cosmic worship. Only through Christ can we reach the real Father in heaven. "Rightfully understood, and spoken in the spirit in which Christ taught them, the words of the Lord’s Prayer have profound and eternal significance. Their key lies in the body of teaching which is known as the Sermon on the Mount. They are illumined by the parables in which Christ explains the relationship between God and man; for example, by the parable of the Prodigal Son; thus, if rightfully understood in this wider context, they become a living path leading us to the Father. "The Holy Spirit teaches us to understand Christ, and in Christ, God and ourselves. It is the kind of understanding which comes from the heart… It is true comprehension; more than that, it is illumination. The Directory of the Ministry and Life of Priests tells us: "There is an ‘essential rapport … between the Mother of Jesus and the priesthood of the ministry of the Son,’ stemming from the existing one between the divine maternity of Mary and the priesthood of Christ. "In light of such a rapport, Marian spirituality is rooted in every priest. Priestly spirituality could not be considered complete if it were to fail to include the message of Christ’s words on the Cross, in which He conferred His Mother to the beloved disciple, and, through him, to all priests called to continue his work of redemption. "Like John at the foot of the Cross, every priest has been entrusted, in a special way, with Mary as Mother (cf Jn 19:26-27). Let us, then, reflect upon the Church as a reflection of the Trinity, the Church as Body of Christ, the Church as Spouse of Christ. The Christian community is a reflection of the ultimate and absolute community -- namely, the Trinity. In a special way, we are privileged to give witness to Trinitarian life, a life of divine intimacy, a life of divine knowing and loving. Grace, or the Christ-life, is a created participation in Trinitarian life. This Christ-life, consequently, calls us to a special existence of knowing and loving. Christian faith and love, which are created participations in the Trinity’s knowing and loving, allow us to know and love God in a special manner. Faith and love also give us a new capacity to relate to both our fellow Christians and to all others..
Because the life of the Trinity is person-centered, so must the life of the Church be person-centered. For many years, it seems, we were not sufficiently person-conscious. However, the theology that has emanated from Vatican II is helping to rectify this situation. In the pre-Vatican II Church, structures in the Church were at times treated by some as if they were ends in themselves rather than as means of serving the persons in the Church. Slowly but surely, structures in the Church are being renewed so that they might better serve their true purpose, which is to aid in the ongoing spiritual development of her members -- leading them closer to the Father, through and with Christ, in the Holy Spirit. The Church, in turn, develops when those who make up that community develop as authentic Christians. Just as each divine Person contributes perfectly to the community life of the Trinity according to the Self-Gift of the fullness of His personhood, so each Christian contributes to the community life of the Church in proportion to the degree of his or her gift of self, according to the degree of his or her personal holiness. Authentic interpersonal relationships help to develop community. The Trinitarian community is a community of profound relationships. Because the Church reflects Trinitarian community, her members are intended to have relationships, not only with the Persons of the Trinity, but likewise with others. Authentic interpersonal relationships not only unite in a deeper knowledge and love the persons directly involved, they also make a person more capable of loving others more deeply, and, therefore, more capable of deepening the bonds of total community. If a person is growing in the capacity to love his or her friends, for example, that person is concurrently growing in the capacity to also love all others -- both those who are members of the Church and those who are not. The fact that the Church is here on earth a reflection of the Trinitarian Community easily leads us to reflect upon the Church as the Body of Christ, since this name given to the Church also emphasizes the communitarian aspect of the Church. St. Paul tells us: For as with the human body which is a unity although it has many parts -- all the parts of the body, though many, still making up one single body -- so it is with Christ. We were baptised into one body in a single Spirit, Jews as well as Greeks, slaves as well as free men, and we were all given the same Spirit to drink. And indeed the body consists not of one member but of many. If the foot were to say, ‘I am not a hand and so I do not belong to the body’, it does not belong to the body any the less for that. Or if the ear were to say, ‘I am not an eye, and so I do not belong to the body’, that would not stop its belonging to the body. If the whole body were just an eye, how would there be any hearing? If the whole body were hearing, how would there be any smelling? Now Christ’s body is yourselves, each of you with a part to play in the whole. And those whom God has appointed in the Church are, first apostles, secondly prophets, thirdly teachers; after them, miraculous powers, then gifts of healing, helpful acts, guidance, various kinds of tongues. Are all of them apostles? Or all prophets? Or all teachers? Or all miracle-workers? Do all have the gifts of healing? Do all of them speak in tongues and all interpret them? (1 Cor 12:12-17; 27-30). Here is a prayer for intimacy with the Lamb, the Bridegroom of the Soul: "O Lamb of God, Who take away the sins of the world, come and act on my soul most intimately. I surrender myself, as I ask for the grace to let go, to just be as I exist in You and You act most intimately on my soul. You are the Initiator. I am the soul waiting Your favors as You act in me. I love You. I adore You. I worship You. Come and possess my soul with Your divine Grace, as I experience You most intimately." The Sacrifice of Calvary is sacramentally made present in the Mass. When we pray the Morning Offering Prayer, united to the Holy Sacrifice of the Mass, we act as Intercessors, pleading to God that great graces be released all day through our prayerful actions as we act in love according to the Father’s will. Whether we are eating, taking care of a sick parent, enjoying time spent with a friend, working at our job, we can help bring down great graces for the world. "O Jesus, through the Immaculate Heart of Mary, I offer you my prayers, works, joys and sufferings of this day, in union with the Holy Sacrifice of the Mass throughout the world. I offer them for all the intentions of your Sacred Heart: the salvation of souls, reparation for sin, the reunion of all Christians. I offer them for the intentions of our Bishops and of all Apostles of Prayer, and in particular for those recommended by our Holy Father ---"
And here is another Morning Offering Prayer: "My dear Father, I offer You this day all my prayers, works, joys, and sufferings in union with Jesus in the Holy Sacrifice of the Mass, in the Holy Spirit. "I unite with our Mother, Mary, all the angels and saints, and all the souls in purgatory to pray to the Father for myself, for each member of my family, for my friends, for all the people throughout the world, for all the souls in purgatory, and for all other intentions of the Sacred Heart. "I love You, Jesus, and I give You my heart. I love you, Mary, and I give you my heart. Amen." "Saint John Mary Vianney did not content himself with the ritual carrying out of the activities of his ministry. It was his heart and his life which he sought to conform to Christ. Dom Hubert Van Zeller observes: "If when we speak of prayer and faith transcending the drawbacks to human existence we mean a blind, uncaring ascent into a dream world where the realities of life are left behind for others to cope with, we have got it wrong... ‘Transcendence’ here denotes...the detachment which is brought about by the spirit, but which has not lost touch with the things of sense. "Without suppressing the emotions, faith enables the soul to rise above the emotions. And if this sounds cold and superior, it must be remembered that those who are essentially souls of faith, the saints, are just those who feel things deeply. It is because they feel things deeply that they are able to help others, and again it is because they feel things deeply that their prayer is all the more pleasing to God. No one has to remind us that we live in a rapidly changing world. The temporal order is very much undergoing a process. It is engaged in a phenomenal manifestation of change. Some of this is for the better, but there is a dimension which is not good, because some of modern society’s becoming is only apparent progress or becoming. To put it in another way, since a certain segment of modern man’s activity is marked by immorality, it is actually retrogression rather than progress. Because we are creatures who are both unchangeable and changeable, our authentic becoming respects both dimensions. We are not meant to become by denying the aspect of stability. We are not to become by always making fresh starts, but by building properly upon what we are and what we have been. To feel psychologically at ease with ourselves, we need to develop a proper balance between the unchangeable and the changeable. Our becoming, our growth, is rooted in God’s will for us. He has made us for continual growth, for continual development. This process of growth depends upon our relationship with God. The Father, out of His great love for us, is always inviting us to a deeper union with Him, through Christ, and in the Holy Spirit. In the depths of our heart we know we want this deeper union with God, and yet at times we are frightened at the prospect. We can be tempted to avoid coming closer to God for fear of what His love may ask of us. This is a critical point in the relationship. Many apparently draw back at this juncture, deciding that the closeness of deep love is too demanding. In our relationship with God -- unlike what can happen in a relationship with a human person who possesses a wounded nature because of sin -- we can be assured that becoming closer to Him will not end in any kind of disappointment. God will never be unreasonable in His demands. Growing, or becoming, through a closer love-union with Him will result in a greater happiness. Our quest for happiness will be more and more satisfied -- not without some pain, because our growth does involve suffering. But whether the suffering be now slight, now moderately severe, or even at times seemingly almost unbearable, we know in the depths of our heart we have to want deeper union with God if we truly want to continue to grow, to continue to become. Growth in happiness means developing the union of love with God. And if this means that suffering is one element of that process, then a voice deep within us, rising from the depths of the authentic self, whispers to us that we should be willing to bear with the pain involved -- for the sake of a deeper life, a greater becoming, a greater love. Although our process of growing or becoming is rooted in our relationship with God, this relationship does not stand alone. According to God’s will, our union with Him involves also other relationships. God calls us to the gift of self in relationships with others. He also wants us to be properly related to material creation. We grow or become, then, through a going out in love to God, to others, to material creation. Much of this becoming is according to a more or less established and predictable pattern. But sometimes God surprises us. Sometimes He asks us to become in a way we ourselves would not have considered. God does not always act according to the more ordinary and predictable ways. He is an infinitely wise God, and His holy wisdom is perfectly capable of leading us along paths previously unknown to us. Whatever the case may be, His ways -- if we follow them -- always lead us to greater growth, to greater becoming, to greater happiness. Henri Nouwen, one of the most well-known spiritual writers of our times, spent an extended period of time as a guest in a Trappist monastery. His following words remind us how a certain amount of prayerful solitude brings us closer to the world, how it helps develop in us a Christian concern for the world: "My stay at the monastery, however, has not only brought me closer to Christ, it has brought me closer to the world as well. In fact, distance from the world has made me feel more compassionate toward it. In my work in New Haven I am often so busy with immediate needs asking for an immediate response that my world narrows down to my daily worries, and I lose my perspective on the larger problems. Here in the monastery I could look more easily beyond the boundaries of the place, the state, the country, and the continent, become more intimately aware of the pain and suffering of the whole world and respond to them by prayers, correspondence, gifts, or writing. I also felt that in this retreat my friends and family came closer to me. I experienced especially that a growing intimacy with God creates an always widening space for others in prayer. I had a real sense of the power of prayer for others and experienced what it means to place your suffering friends in God’s presence right in the center of your heart." 19 Most people cannot arrange for an extended time of retreat in a monastery. Everyone can, however, structure times of prayerful solitude into one’s schedule which allow, among other things, for a deepened awareness and concern for the world with its many problems and challenges. In turn, this deepened concern for the world should lead to increased prayer for all the world’s needs and other appropriate activity in accord with one’s vocation and opportunities. There is still so much to be done to make this world more what God destines it to be. As the Christopher Movement’s motto reminds us: "It is better to light one candle than to curse the darkness." Jesus calls us to surrender. He wants us to let go, to relate to persons, places, and things only according to His will. He wants us to renounce those things which prevent a closer union with Him. If we do this, we will experience the joy of being free, the joy of being deeply united to Him, the joy of being deeply possessed by Him. Sometimes we are tempted to think our efforts are rather useless. We must resist the temptations. The battle is hard, and the path at times seems to be all uphill. We have to pray for the light to realize that our efforts put forth for God are not in vain. When we are united to Jesus, our efforts are having a great effect in the work of the Kingdom. Let us keep our candles burning. Let us keep our focus on Jesus, and not worry about results. Our lives spent in Jesus’ service please Him greatly, and they produce great good, although so much of this good can be hidden from our eyes. Many of the laity pray for us priests, and consistently so. Is it not also fitting that we priests pray for all our brothers in the priesthood, and consistently so? There follows a prayer that can aid us in this endeavor. "Lord Jesus, Chief Shepherd of the Flock, we pray that in the great love and mercy of Your Sacred Heart that You attend to all the needs of Your priest-shepherds throughout the world. We ask that You draw back to Your Heart all those priests who have seriously strayed from Your path, that You rekindle the desire for holiness in the hearts of those priests who have become lukewarm, and that You continue to give Your fervent priests the desire for the highest holiness. United with Your Heart and Mary’s Heart, we ask that You take this petition to Your heavenly Father in the unity of the Holy Spirit. Amen". "Jesus, You show us Your Heart as symbol of Your life of love in all its aspects, including Your most special love for each of us as unique individuals. Out of Your great love for us, You died a brutal death, nailed to the wood of the cross. Out of Your great love for us, You rose gloriously from the dead. "From Your pierced Heart the Church with her life-giving Sacraments was born. 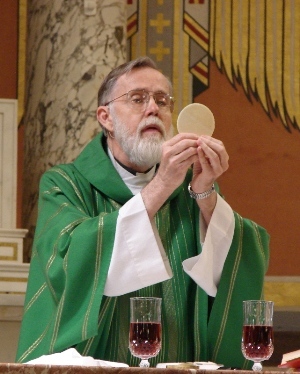 In the Eucharist, Crown and Center of the Church’s life, You continue to give Yourself to us with the deepest, most tender, most on-fire, most complete love. "Jesus, since in Your great love You give Yourself so completely to us, it is only fitting that we make a gift to You in return. It is entirely fitting that we give ourselves completely to You. Yes, we consecrate ourselves to Your most loving Heart. Each of us says to You, O Lord, our Savior and our Friend: ‘Jesus, take me wholly, take me completely to Your magnificent Heart. Out of love I give myself to You. Live in and through me. In love You give Yourself completely to me. In love and in a spirit of reparation, I want to give myself, with the help of Your grace, entirely to You. Take me, Jesus, to an ever closer union with the Father, in the Holy Spirit, with Mary my Mother at my side. Pierced, Glorified, Eucharistic Heart of Jesus I place my trust in You.’ "
"Dear Blessed Virgin Mary, I consecrate myself to your maternal and Immaculate Heart, this Heart which is symbol of your life of love, including your most special love for me as this unique individual. You are the Mother of my Savior. You are also my Mother. In a return of love, I give myself entirely to your motherly love and protection. You followed Jesus perfectly. You are His first and perfect disciple. Teach me to imitate you in the putting on of Christ. Be my motherly intercessor so that, through your Immaculate Heart, I may be guided to an ever closer union with the Pierced, Glorified, Eucharistic Heart of Jesus, Chief Shepherd of the flock." Loving and cordial greetings to you from Most Rev. G. Johannes, Bishop of Kurnool. I am glad to learn that you are publishing a magazine by name Shepherds of Christ. Recently, I was given some magazines to be distributed to our priests by Most Rev. Bishop S. A. Aruliah of Cuddapah and the magazines are very good and worth reading. As the magazines are useful to our priests, I would like to get them for our priests too. Presently there are 70 priests in our diocese and distribution of these magazines to our priests will surely help their spiritual life. As your magazine covers so may theological, pastoral themes, it helps our priests in their pastoral life. Hence, I request you to send at least 70 Shepherds of Christ magazines to us so that we may distribute to our priests. 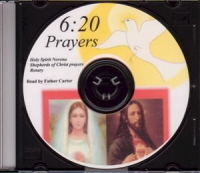 I also request you to send some audio-video tapes which can help our priests pastorally. Dear Father Edward J. Carter, S. J.
Greetings and good wishes for Christmas and happy New Year 2000! I am a diocesan priest. I am working in Mbinga Diocese. I, by good chance, came across your Shepherds of Christ, A Spirituality Newsletter for Priests. After having read it, I decided to ask for a free copy of the newsletter both in cassette form and in book form. I believe that this book and the cassette will continue helping me to fervently renew my spirituality. I hope that this will be useful too to my fellow priests who are engaged in the pastoral activities. 1. Scripture quotations are taken from The New Jerusalem Bible, Doubleday. 2. Pope John Paul II, On The Christian Meaning of Human Suffering, United States Catholic Conference, Nos. 19 and 23. 3. Dom Hubert Van Zeller, More Ideas for Prayer, Templegate, p. 112. 4. Edward Leen, C. S. Sp., Why the Cross?, Sheed & Ward, pp. 246-247, 255, 285. 5. Caryll Houselander, The Way of the Cross, Sheed & Ward, p. 21. 6. Henri Nouwen, Out of Solitude, Ave Maria Press, p. 57. 7. Romano Guardini, Prayer in Practice, Pantheon Books, p. 115. 9. Directory on the Ministry and Life of Priests, No. 68, as in Inside the Vatican, Special Supplement, November, 1994, p. 25. 10. Henri de Lubac, S. J., The Church: Paradox and Mystery, translated by James R. Dunne, Alba House, p. 24. 11. The Thought of Pope John Paul II: A Collection of Essays and Studies, John M. McDermott, S. J., Editor, Editrice Pontificia Universita Gregoriana, p. 135. 12. The Documents of Vatican II, "Constitution on the Sacred Liturgy," America Press edition, No. 17. 14. Pope Pius XII, Encyclical Letter, Mystici Corporis, AAS, XXXV, pp. 232-233. 15. Saint John Vianney, "Sermons for Holy Thursday", in Eucharistic Meditations, editor Sr. Mary Benvenuta, O. P., translated by Abbé H. Convert, as in Adoration, compiled by Daniel Guernsey, Ignatius Press, p. 96. 16. Pope John Paul II, Holy Thursday, Letters to My Brother Priests, edited by James P. Socias, Scepter Publications and Midwestern Theological Forum, p. 148. 17. Dom Hubert Van Zeller, More Ideas About Prayer, Templegate, pp. 50-51. 18. The Documents of Vatican II, "Pastoral Constitution on the Church in the Modern World", America Press Edition, No.5. 19. Henri Nouwen, The Genesee Diary, Doubleday, p. 212. 20. Story of a Soul, The Autobiography of St. Therese of Lisieux, ICS Publications, p. 200.